Updated Wednesday April 3, 2019 by Cory Thomas. 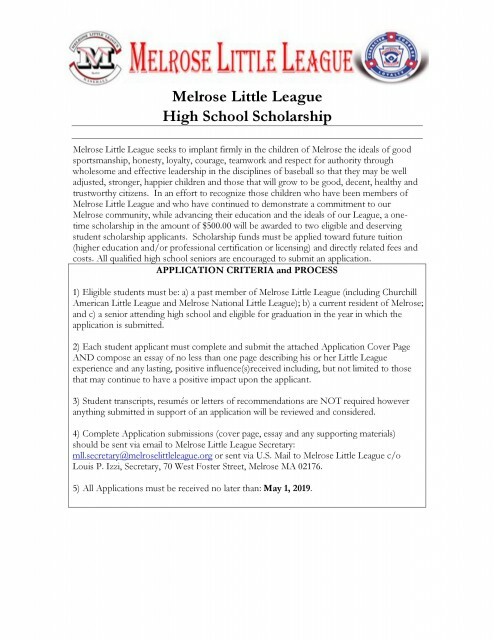 Melrose Little League is proud to announce we will be offering the 1st Annual MLL Scholarship to a graduating High School Senior in 2019! Interested High School Seniors that played Little League baseball in Melrose (CALL or MNLL) need to apply on or before May 1, 2019. Please visit www.melroselittleleague.org for more information or contact Lou Izzi or Cory Thomas with any questions. Thank you, best of luck to the applicants, and Go Melrose!